Achieve a totally calm state of mind and feeling of inner peace as you lie back and relax on a warm bed. You will receive a deep, calming hot stone massage while the warmth helps soothe aching muscles. With the careful combination of smooth hot stones and the hands of a skilled therapist, this treatment concentrates on giving you a deep, therapeutic massage. The warmth of the stones transfers through your muscles, allowing a deeper treatment which will leave you feeling renewed, relaxed and calm. 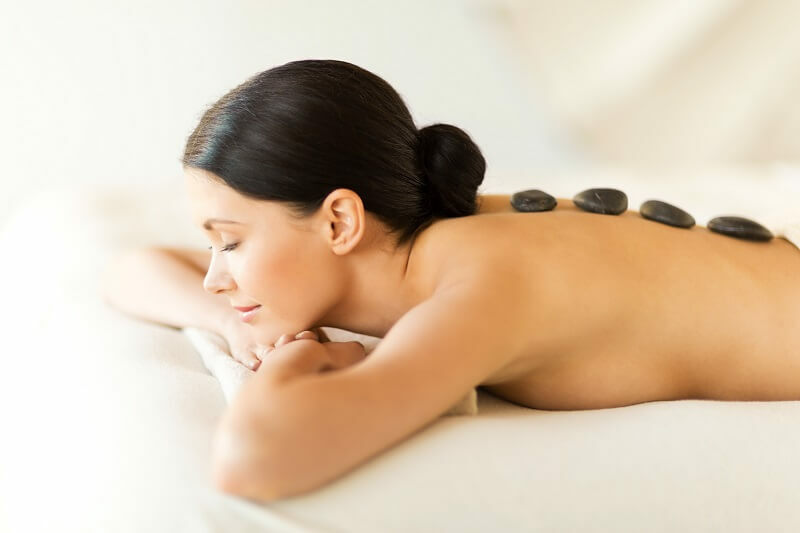 A hot stone massage is perfect for customers who prefer a lighter massage; heat from the stones helps to relax the muscles, which in turn allows the therapist to treat the muscles using less pressure. Q: What should I expect from my first massage? A: Your first massage will include a consultation with your therapist to determine what you want to acheive from your appointment. Your therapist will then explain what she is going to do and which parts of your body she will work on. A: You should undress to your level of comfort. Usually down to your pants however, you can remove all clothing should you wish to do so. Q: Can I cover myself with a sheet or towel? A: You will always be covered by a towel during your massage with exception to the area your therapist is working on. Q: What do I do during my massage? A: Lie down and relax. Massage is an enjoyable experience for you to immerse yourself into. Q: How long does a massage treatment last? A: You can choose to have a 40 minute massage or a 60 minute massage. Q: Will a massage be painful? A: Sometimes, dependant on what you are looking to get out of your massage. The depth and firmness of the massage will be adapted to your individual needs and level of comfort and therapeutic needs. Your therapist will confirm if you are happy with the pressure during the treatment and you can also let your therapist know at any time if you would like the pressure adapted. Q: How often should I have a massage? A: This is entirely dependant on your individual needs. This could be anything from every two weeks to once a month. Your therapist will give you a personal recommendation when you come in for your treatment. We offer a discount for multiple session to make regular massage more affordable. Q: Can I talk during my massage? A: You can if you wish to however, most clients tend to drift off to sleep during their treatment. A: You should feel relaxed and light after your massage. The massage will have released some tension and toxins from your muscles. If you have opted for a deep tissue massage you may feel a little tender where your therapist has worked out some muscular knots. Q: When should I get a massage? A: At any time you feel you would like a massage or are experiencing some discomfort in your body. However if you are pregnant or have just recently given birth we would recommend you go for a pregnancy massage to ensure it is more enjoyable for you. A: Your therapist will give you advice on what aftercare you need after your massage appointment. Normally we recommend you take it easy for the rest of the day and drink plenty water.